Celebrating Boston’s graffiti history using intense color, bold lines, and stylized lettering. Deme recreates an iconic setting from the late 1980’s when the orange line rode on riveted green, steel, high above ground. 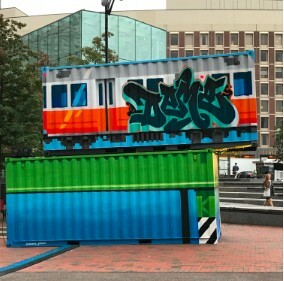 Driven by the sounds of hip-hop and his hometown of Boston, Deme5 is best known for his ability to wield a spray can as if it is a paintbrush. A graffiti artist at heart, Deme’s goal has always been able to show what is possible with aerosol. Using neither projectors nor grids, he’ll transpose a 5"x7" concept to a 100' wall simply with skillful eyes. His work is sought after by established businesses and inventive entrepreneurs alike.